It started with the dogs barking. We were up a little earlier than usual, and the dogs were doing their morning investigation of the backyard. It’s not unusual for them to bark in the morning. Living in a rural setting, our property is subject to a variety of tourists in the night – and they often are just departing as the sun is rising. This is also the time the barn cats begin to mill around the yard, awaiting our morning pilgrimage to the barn … and our dogs aren’t fond of the barn cats! So, I thought little about the barking. The first sign that things were other than ordinary was the loud cackling of the chickens. If you’ve lived around chickens, you may know what I mean. It often happens after a hen has laid an egg – a very loud, rapid cackling punctuated by a harsh upper range tinny yelp. It is often echoed by one or more of the other chickens, setting up quite a loud chorus! Not unusual in itself, but uncommon at an early hour. As I listened, I suddenly realized that the hen carrying on was being answered by Charles, our roaming rooster, who had stopped short of entering the barnyard. This was certainly unusual, as Charles has his routine … and rounds of the barnyard is his first stop. This required further investigation. I slipped on my shoes and went out the back gate. There was Charles, still echoing the hen in the coop, who I could now tell was Rosie our white hen. Charles had the look of caution, as only a chicken can. Assuming the issue was in the chicken coop, I headed that way. As I rounded the pump house, in advance of reaching the coop, Rosie stopped her cackling and jumped down from her perch on their feed can. Charles too became silent and advanced on my heels. Assuming that whatever had been wrong was resolved, I decided to continue to the barn to give the horses snacks. As I approached the large side door, I could see across Coffee’s stall and into Noble’s. Both horses were on high alert, Coffee snorting and acting agitated. He did a small spin around his stall and peered out the back door. Something was definitely unusual about this morning! I continued beyond the barn toward the back acre. As I cleared the corner of the barn, I could see Java in his paddock – also head high and snorting, gazing toward the back. These little buggers grew up in the barn – only the dogs get upset about them. I scanned the horizon, walking across the back and peering for some telling movement. Nothing! Well, whatever it had been was clearly gone. I began to run through the possibilities. Possum and skunk are the most common visitors – but neither of those ever raise any alarm with the horses. Raccoon is another occasional visitor, but they can’t clear out that fast. Wild turkeys have come through a few times, and do get a rise out of the horses – but they travel in groups, and rarely bother to move that fast. If it had been turkeys, I would have caught sight of them. So, it had to be something fairly large, and rather speedy. That left only three likely candidates: stray dog, fox or coyote. All have been seen on our property. Whatever it was would apparently remain a mystery, since it appeared to be long gone. I threw the horses some snacks and went back in to get breakfast. After breakfast, it was time for chores. I grabbed a cart full of hay, and headed out to the turnouts to prepare for the horses. As I passed Coffee’s stall, I noticed he was once again mildly agitated. Still not over whatever happened earlier, or so I thought as I continued to the back. I was nearing the first turnout when I realized I was not alone. Just as my brain was registering this fact, a juvenile coyote jumped up out of the patch of shade she’d been resting in, about fifty feet ahead, and streaked toward the back fence. Mystery solved! I went a short time after and took a tour in the tractor. I hated to spook the coyote out to other properties and possible danger – but we have too many animals in our care to ignore such a threat to their safety. Fortunately, the young thing must have taken that time to find her way out and to some safe place – there was no sign of her anywhere. I always love seeing the wild visitors to our property. However, like relatives, there are some that you prefer to see less often and have stay for only brief visits! This entry was posted in Just For Fun and tagged barnyard drama, Charles, Coffee, Java, mystery visitor, Noble, wildlife. Bookmark the permalink. What a cute little family of skunks! I wish I could be as okay with wildlife coming to visit as you seem to be. Possums kind of give me the heebee jeebees, especially after my farm has had several (sadly fatal) run ins with EPM over the years. I completely understand not being comfortable with the wild critters! 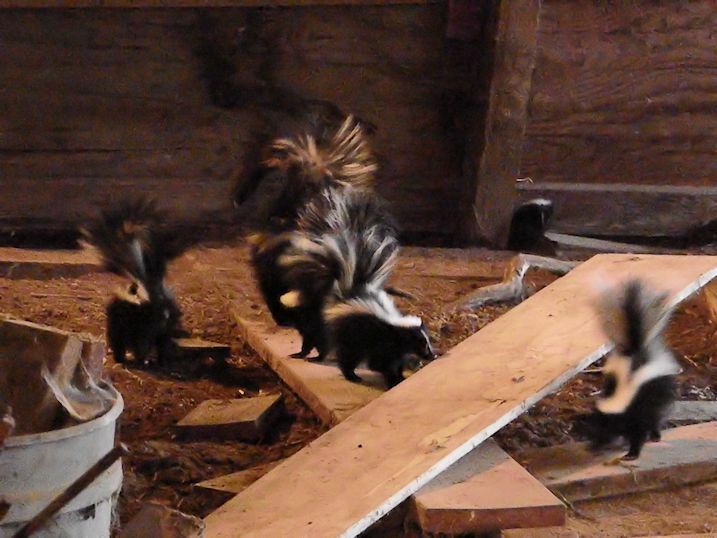 The skunk family was a big surprise, but it was fun to see how they and the cats mingled with no concerns. When the first possum family showed up, I checked with my vet – we’re apparently pretty well clear of EPM in our area, with just a couple of small pockets a good distance away … that made me feel a bit better, though we’re still careful, and keep fingers crossed! I happen to be a big possum fan … which I know puts me in a very small group! 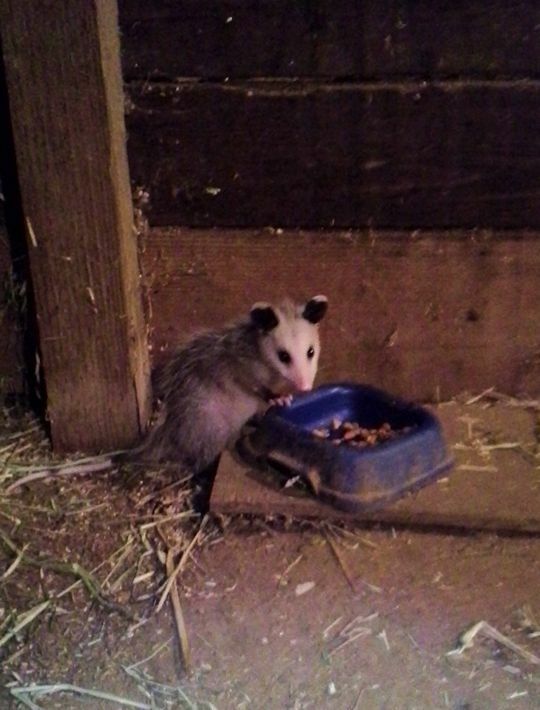 I actually had a pet orphan opossum when I was a kid, and he was pretty mellow and friendly. I guess I don’t mind the animals themselves, just their unfortunate status as carriers of the disease. It’s lucky that your vet said their isn’t reason to worry in your area!